Every December, Siberian winds carry thousands of migratory birds south to Wuhan, marking the beginning of bird watching season. Cheng Benze, chief of the wild animal protection section at Wuhan Municipal Bureau of Landscape and Forestry, described how these migratory birds mostly fly from East Asia to Thailand and Australia, although some fly to India and Africa to spend the winter. Wuhan is along one of the three migratory flyways of China. 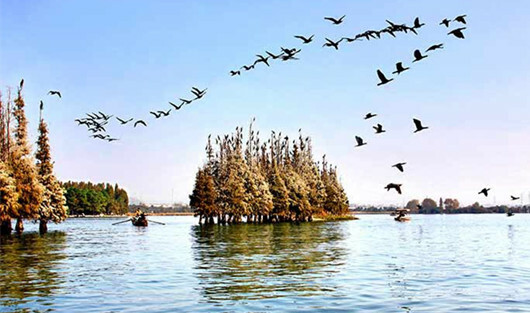 Fertile wetlands in Wuhan also provide migratory birds with the necessary environment, food chain, and conditions. 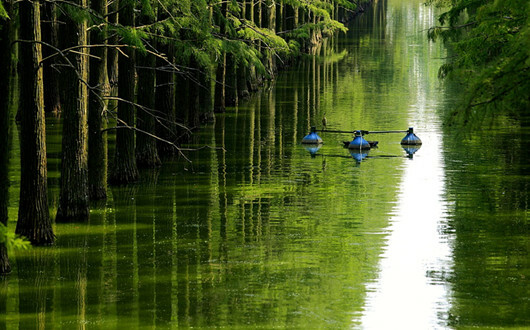 According to Cheng, Wuhan has established five natural protection zones with wetlands, and a series of wetland and lake parks; the city has also designated and protected bird habitats. This year, members of the Wuhan Bird Watching Society spotted new species, such as the Whooper swan and Red-necked Phalarope in Fuhe Wetlands, and the Yellow-streaked Warbler in Bafen Mountain. Yan Jun, the president of the Wuhan Bird Watching Society, told our reporter that each local wetland is famous for a specific migratory bird species. 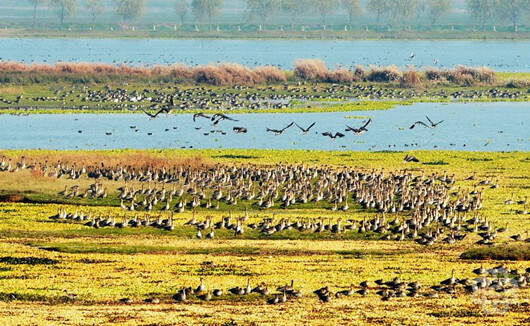 Under Yan's guide, our reporters visited four wetlands renowned for bird watching: they are Chenhu Wetland in Caidian District, Luoyan Scenic Spot of the East Lake Scenic Area, Zhangdu Lake in Xinzhou District, and Fuhe wetland in Dongxihu District. Chenhu Wetland set up a bird protection station, equipped with eight telescopes allowing visitors to closely observe the birds. 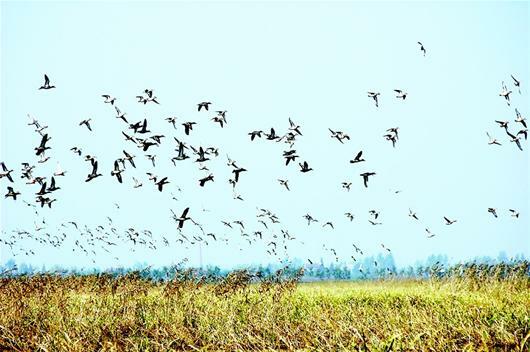 Yan Ju said Chenhu Wetland is favored by migratory birds. "It is located on the flyway from East Asia to Australia, which is why it attracts so many migratory birds every winter. People can find wild geese foraging and resting here, and spot Eurasian Spoonbills or heron. If you're lucky enough, you may come across some rare species, such as white storks and oriental white storks, which are classified as National First Grade Key Protected Wild Animals." During the winter, the bird population in this area often exceeds 30,000. On December 4, flocks of cormorants were observed arriving at the Luoyan Scenic Spot. The Chinese name, Luoyan, refers to "the place wild geese land." This scenic area is surrounded by Tuanhu Lake, a place which was once a natural habitat to wild geese. Nowadays, cormorants are regulars in the area. "This area is filled with a dense collection of redwood trees, fish and shrimp, and the small island is far away from the lake bank, which creates a quiet, isolated place for birds, it is a perfect home for cormorants." said Yan Jun. A group of nightingales were seen hovering in the sky in Zhangdu Lake Wetland on December 4. It is said that when Chinese new year is approaching, people can experience the wonder of seeing black-headed gulls mingling, resting, and feeding within fifty kilometers of the wetland. Professor Liu Shengxiang at Central China Normal University said that black-headed gulls demand a high environmental quality. Fish and shrimp living in the wetland supply gulls and another 160 species of birds with food. "The black-headed gulls' annual visit to Zhangdu Lake Wetland shows that the environment in the area remains suitable." Every year, Professor Liu brings around one hundred of his students here to watch the birds. From November to March of next year, over 20,000 birds, including bean geese, graylags, and swans arrive in Fuhe Wetland from Siberia. Duan Linfei, a senior student at Central China Normal University, has routinely visited Fuhe Wetland over the past four winters, "Last year, members of the Wuhan Bird Watching Society spotted a flamingo here, which is a rare sight. We also encountered a barnacle goose, a species that's never been seen in the area. Every year we find unexpected new species in Fuhe Wetland." Jiang Yongchao, a member of Baiquan office of Dongxihu District, said that over 10,000 birds have been seen since the start of winter. A numbers of swans gather in the Xiagang Area of the wetland, which also accommodates rare species such as Baer's Pochard and Eurasian Spoonbills.